"As a child I loved polishing shiny metal, even the stove tops in my grandma’s kitchen. After professional training and decades of working as a jeweller I still like forging gold and silver, whilst exploring new materials and technologies." Evelyn Vanderloock completed her jeweller‘s apprentice in the early 80s. Design in England, and graduated in 1993. 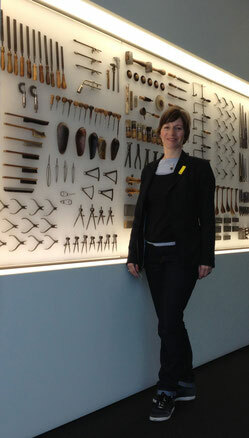 Her professional career as a jeweller for Hilde Leiss' Galerie für Schmuck in Hamburg through to 1999, was followed by the opening of her own gallery tresor in Hamburg. Evelyn also undertook jewellery design projects for Montblanc collections till 2004, when she left tresor to focus on design and making her own serial jewellery.